(Nanowerk News) The European Research Council (ERC) has awarded Prof. Thomas Elsässer an 'Advanced Grant' of 2.49 Million Euros. The project aims at elucidating extremely fast processes which determine the properties of hydrogen bonds in molecular systems. 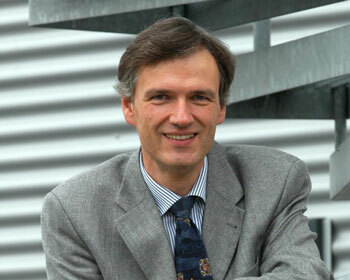 Thomas Elsaesser who is with the Max-Born-Institute for Nonlinear Optics and Short Pulse Spectroscopy in Berlin, Germany, is one of the leading researchers in ultrafast science, studying ultrafast processes in condensed matter. His project is devoted to unraveling changes of molecular structures on the length scale of a chemical bond and the ultrashort time scale of molecular motions. This work will cover aspects of physics, chemistry and biology. ERC Ad-vanced Grants allow exceptional established research leaders to pursue frontier research of their choice. Hydrogen bonds are weak chemical bonds and represent a fundamental interaction in nature. They determine the structure of biomolecules such as deoxyribonucleic acid (DNA), the basic carrier of genetic information in cells. On the other hand, they undergo fluctuations due to their weak binding forces. In water, this leads to extremely fast changes in the arrangement of molecules including the breaking and reformation of hydrogen bonds. Although hydrogen bonds have been studied for a long time, their structural dynamics which occur in the femto-second time domain (1 femtosecond = 10-15 s = one millionth of a billionth of a second), are understood only in part. Within the project, novel methods of ultrafast optics in a wavelength range from the far-infrared to hard x-rays will be applied for investigating hydrogen bonds. A key goal consists in measuring molecular structures in real-time by initiating and reading out structure changes with ultrashort light pulses. X-ray pulses of a wavelength comparable to the length of a chemical bond allow for generating a sequence of 'snapshots' of molecular structure. Infrared pulses give insight into local motions of specific molecular groups. In the experiments, the interaction of DNA with its aqueous environment will be studied, i.e., the coupling of water molecules to different functional units of the DNA double helix, the fluctuations of the water shell around DNA, and the role of water for the redistribution and the transport of energy from DNA into the environment. Hydrogen bonds play a key role for a broad range of biochemical processes and, thus, the results are expected to be of broad relevance. In a second part of the project, structures generated by charge and/or proton transfer will be studied in hydrogen bonded molecular crystals. Such elementary chemical processes govern the electrical properties of the materials which are of interest for applications in novel ferroelectric devices.